On a hill at the southern border of the Val d’Orcia sits one of the most spectacular fortresses in Tuscany, for centuries one of the most important strongholds in Italy: Radicofani. The castle can be seen from dozens of miles away, and it appears to dominate the village, where it guarded the border between the Grand Duchy of Tuscany and the Papal States for hundreds of years. Built just after the year 1000, the fortress was renovated many times over the centuries, partially knocked down in the 1700s before being officially restored in the 1900s. 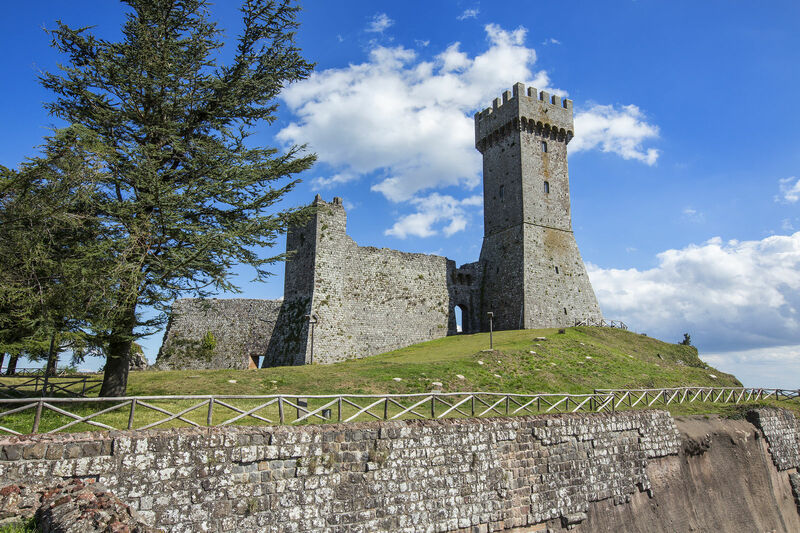 From the balcony at the top of the tower, you can enjoy a vastly extensive view, from the entire Val d’Orcia to Monte Amiata, the Apennines and the Trasimeno and Bolsena lakes. Before heading down to the village, it’s worth taking a walk in the pine groves surrounding the castle, but pay close attention: you’ll run into arches, vaults and wells hidden in the greenery along the way. The most interesting monument in the medieval village is the Romanesque Church of San Pietro, built in the 13th century, damaged during WWII and restored in 1946. Inside, with its low Gothic arches, you can find a splendid collection of Della Robbia terracottas and wooden statues, including the Madonna and Child by Francesco di Valdambrino. Behind the church is a piazza boasting a similar view of the south that you can see from the fortress. On the main road, you can find the Church of Sant’Agata, whose altar vaunts a large terracotta reredos by the Della Robbia.Palazzo Pretorio is also worth a visit, an imposing building that proudly displays a variety of stone coats of arms of historic families. In the Maccione gardens, there’s a statue of Ghino di Tacco, who was the lord of Radicofani for many years. On the old via Cassia, you’ll want to see Palazzo della Posta, a beautiful Medici villa transformed into a customs house, visited by many illustrious travellers. Following a road that winds between the ravines, you’ll come to the medieval village of Contignano. But before arriving, it’s worth taking a stroll in the Bosco di Isabella, a fascinating garden built by the Luchini family in the late 1800s. Odoardo Luchini, an expert in botany, personally curated the bedding of these plants coming from all over the world.